(A) Mission aborted - No credit. For mission dates and targets see the missions list. Crew Notes: 2Lt Oliver T. Eisenhart (P) - Missions flown: As CoPilot with Capt Charles A. Callahan crew - Nineteen missions (261, 265, 266, 267, 268, 269, 271, 273, 274, 275, 277, 278, 279, 281, 283, 285, 286, 290, 294); As CoPilot with other Pilots - 4 missions (259, 284, 287, 297). For crew on missions 300 and 301 see 427th BS 2Lt Henry W. McCullough Crew Page. #43-38689 with the 2Lt Eisenhart Crew out of control. Mission #301, 13 January 1945 to Mannheim, Germany in B-17G 43-38689 (no name)(427BS) GN-A. 2Lt Oliver T. Eisenhart was flying as 1st Pilot with the 2ndLt Henry W. McCullough crew. 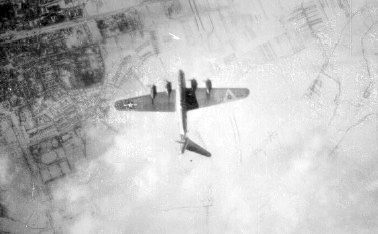 B-17 received a direct flak hit on the tail which blew off the left horizontal stabilizer and pulverized the whole tail. The aircraft started down in a steep dive, then broke up in the air and crashed at Roxheim, Germany. The crew of nine men were killed in action.